Good quality tank, nice thickness. My only complaint (which is the same for the silk seamless bra) is that I hate the removable cups that they use. The shape is too rounded. I replaced them with cups from Lulu and it is great. This is the best nursing tank! It's very comfortable and quite supportive for a shelf bra. It's nice that this newer style has removable padding, this is the third one I have now. Love it. Comfortable for day and night use. This top is wonderful. I've tried a number of nursing tanks and find the support far too light for my (ahem) substantial needs. These tops are comfortable to wear day and night, and the fabric is thick but breathable. The only downside are the clips, which I struggle to operate one handed. They are NOT the same as the clips on the body silk bra line from Bravado. Although these clips have a nice, flat profile when fastened, I'd much prefer Bravado's usual clip. Love this top. Very well made, keeps shape after numerous washes. I am disappointed with the quality of the fabric, and the foam inserts are puckery and bumpy if breasts don't fully fill the bra, so I never ended up using them. Although I did like that the bra part folds down well for easy nursing, the most disappointing part is the bra clasps are awkward and difficult to undo and do up with one hand, especially when night nursing. 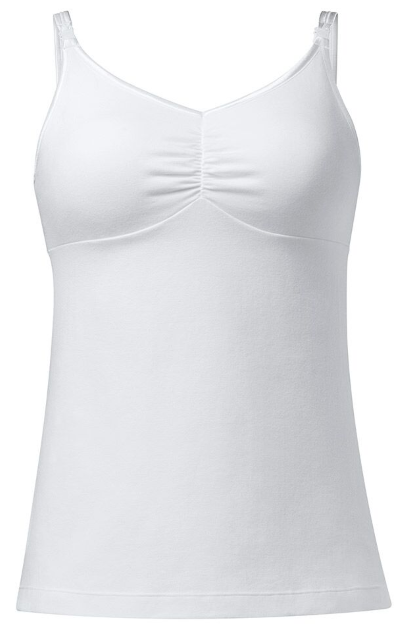 This tank is just like the Body Silk Bra! Extremely comfortable (with removable inserts) and just the right length (longer).